A backpack has been on my list of things to make for an embarrassingly long time. 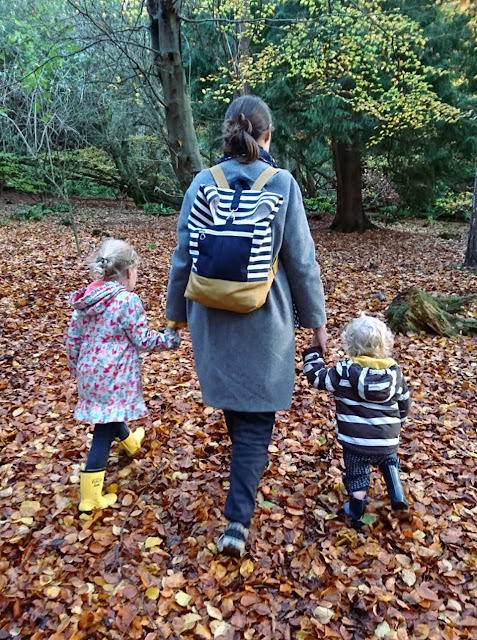 There have been many trips to the woods, beaches, parks, playgrounds and so on with my kids where my shoulder bag/s kept getting in the way, and having my hands completely free would have made the experience easier and more fun (for me). The last straw came about six weeks ago when a friend and I took our little boys for a walk in the woods. I was carrying my usual shoulder bag and a cumbersome changing bag on my shoulder, and Frankie refused to walk, demanding to be carried round the whole trail. 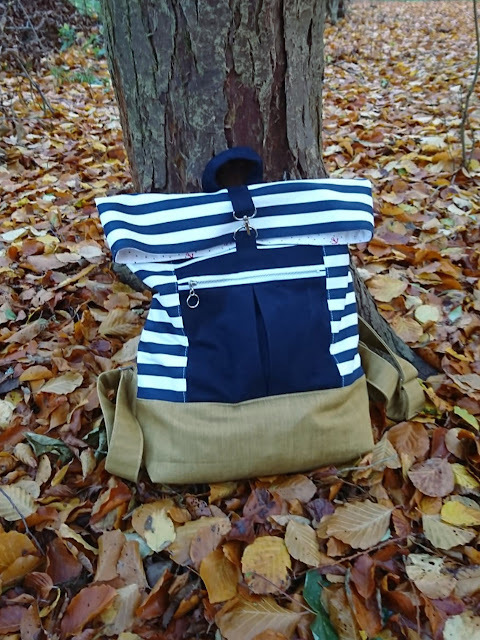 I decided that enough was enough, and later that evening I purchased the Range backpack pattern by Noodlehead that I'd been eyeing up, and set about collecting all the materials to create my ultimate backpack. Let it be known that working on a Range backpack project is no act of whimsy. There are A LOT of pattern pieces (even the front pocket has its own lining) and it requires at least three different fabrics plus fancy, profesh-looking hardware. 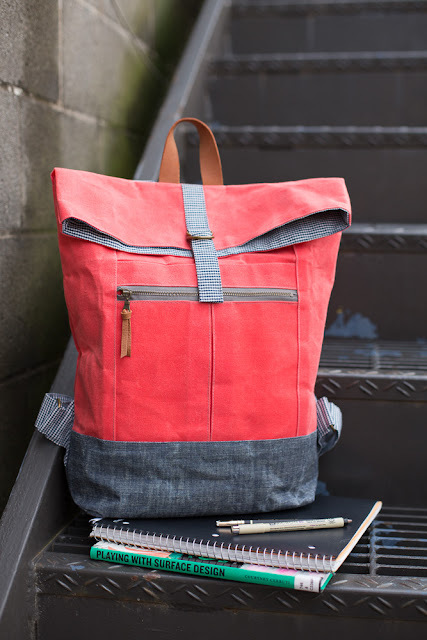 Following the #rangebackpack hashtag on Instagram showed me that wildly differing looks could be achieved by the choice of fabric, and that it wasn't necessary to cut the pattern pieces from the fabrics that are suggested by the pattern (for example, the pattern suggests to use the same fabric for the lining and the strap pieces). However, I don't want to give the impression that it is not a great pattern nor an unnecessarily challenging project. The pattern is very well designed and thought out, with excellent and very detailed instructions. The pattern itself is given as dimensions rather than actual pattern pieces because it's comprised entirely of rectangles, and the designer has thoughtfully included a sheet of little square labels that you can cut out and pin to all your pattern pieces so you don't get confused by all the rectangles of fabric that you've amassed after cutting. I found these little labels particularly useful for planning which pattern pieces I was going to cut from what fabric as I was decided to not to follow every fabric/pattern piece suggestion, partly for aesthetics and partly because of fabric limitations. The cutting out part took about the same time, if not longer, than the actual bag construction part. Putting all the pieces together was straight forward and methodical, even with the painstaking pattern matching I'd signed myself up for. I made this bag in small instalments of time over a period of about a week, and it was thoroughly exciting to see the pile of rectangles slowly take shape into a 'real' bag! Because this project was going to be a bit more time-consuming, brain-taxing and financially costly than most of my sewing projects tend to be, I wanted to get this as close as possible to my Ultimate Backpack. The main way I was going to achieve a finished bag that was totally 'me' was through the fabric/colour choice. I scratched my head and poured over the hashtag seeking inspiration. Eventually, I found two remnants (some striped pique and some mustard denim) at Fabric Godmother, and I knew the hunt was over. What says 'Zoe's Style' more than navy/white stripes and mustard?! As I mentioned previously, I didn't tie myself to the fabric suggestions of the pattern. I wanted to use the heftier denim rather than a lining fabric for my straps, for example. However, the mustard denim remnant wasn't quite big enough to cut all the pieces I had hoped it would stretch to, and I didn't want to over-use the stripes, so it became clear that I'd need to introduce a third fabric. Luckily, my stash contained some scraps of lovely solid navy peachskin cotton twill that I ended up incorporating quite a bit, plus some spots-and-anchor print cotton for the lining. I was able to keep costs down further by turning to my stash for interfacing as well. The pattern suggests that you interface EVERYTHING, so I used up all sorts of weird scraps and leftovers of fusible interfacing for the various pieces. I decided against interfacing the lining pieces as I didn't want to bag to end up too stiff or heavy, and in the end I peeled the interfacing off some of the other pieces that I decided wouldn't need it. I searched the internet for a zip with an anchor or nautical shaped zip pull, but failed on that one, so ended up using a silver coloured metal teeth zip from my stash. The pattern calls for D-rings to fasten the closure, but I'd seen on Instagram that some people had swapped this for a hook/catch type fastening instead, which looked like it would lead to quicker and easier access. I found all the hardware I needed from U-handbag (owned by my lovely friend Lisa Lam) and ordered my swivel snap hook, D-ring, rectangle rings and rectangle sliders. As you can see above, this bag performs its task of containing my stuff whilst allowing my hands to child-wrangle perfectly! It's surprisingly spacious as well; I can now carry water bottles/sippy cups, snacks, emergency-nappy-and-wipes along with my usual purse, phone, sun glasses case, fabric shopping bags, hand cream and so on without feeling loaded down. The front pocket allows for easier access to a hanky, keys and lip balm. However, as useful as I have found this bag so far, I still prefer to use my regular shoulder bag (made with my Anya shoulder bag pattern, of course!) when I'm walking around on my own or going shopping with the pushchair. My Anya bags allows for much quicker access to my belongings, and hangs on the handles of Frankie's pushchair better than this backpack does: the latter ending up a bit too low. What a fab bag. I think all the fabrics work together wonderfully. You could add a small nautical themed charm to the zip or elsewhere if you wanted. They are available in packs in craft stores. I must say, your new bag is just So, Zo! Perfect! I love this! Anna's (Noodlehead) patterns are always so cute. Her Open Wide Pouch was the first thing I ever sewed and I was hooked. I like your fabric choices and I am sure you will get a lot of use out of this one. Happy sewing! Nice! It definitely is SoZo style! Thank you all for your lovely comments! @Taja you are totally right, I hadn't thought about it before but Mr SoZo could totally grab that bag without thinking twice! This looks great and perfect for you! I made my one and only backpack kind of on a whim, and while it could definitely be better, I get a TON of use out of it, so definitely no regrets.